Silver Oak offers a wide variety of slots for its players. We’ll take a look at two of the website’s most popular games – Sevens & Stripes and Achilles – and give you the rundown on how to play both and how you can become an instant winner. If Uncle Sam, Bruce Springsteen, or Clint Eastwood were gamblers, this is the game they’d play. Built for the Ultimate American, Sevens & Stripes allows you to show your patriotism and win some money in the process. What could be more American than that? This game has the usual 3-slot action plus a progressive jackpot to keep things exciting. Once players put in their credits, they can bet up to 3 credits per spin. Note, players are only eligible for the progressive jackpot by betting the max (3 credits) per spin. The Pay Table, which is visible while you’re playing, shows all the ways you can win money. But, if you’re looking to hit a Mickey Mantle sized home run, the Progressive Jackpot pays out if you hit: A red 7, Blue 7, and a White 7 on the payline while playing 3 credits. 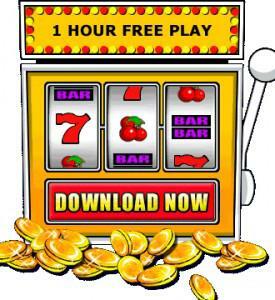 A tribute to old school slots, this game is a classic and certainly pays to play. If you’re looking for a journey that pays a lot of money, than this is the game for you. Join Achilles on his epic odyssey as you try and navigate your way to big winnings and a Progressive Jackpot. Sit down, armor up, and prepare for battle as this game as everything you’ll need to become a quick winner and create your own epic journey. With a maximum of 20 lines and wager of $50 per line, this game makes it easy to go from zero to hero in no time. Note, that once you hit the bonus round, all winnings are based on the amount of your original bet, so choose accordingly. Now, how do you get into the bonus round? With the help of Achilles, of course. Troy is the scatter symbol for this game, and finding 3 or more will win you cash on the spot. In addition to the cash, you’ll start one of Achilles’ two bonus games, which can lead to even more money. Also, be on the lookout for Achilles himself who will act as a wildcard space and substitute for any space, except for Troy. There you have it! Whether you’re looking for the All-American Experience, or you want to take on an epic odyssey, Silver Oak has you covered.